Teamsters Union 987 is a family. Across Alberta, over 5,000 members take comfort in knowing they are supported by a strong community of empowered workers who stand up for their rights on the job. 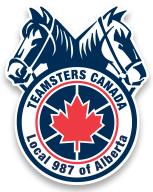 Along with the Board, Teamsters Union 987 employs six full-time Business Agents to handle members’ grievances and to negotiate collective bargaining agreements with employers. As visible, independent representatives, they listen to and defend the rights of Teamsters Union 987 members. They are advocates in progressing the labour movement for better worker rights and benefits. Our Business Agents are especially skilled because like you, they worked from the ground up. They were once members like yourselves and faced the same workplace issues as you do. Now, they have built their careers around fighting for you, day in and day out. Teamsters Business Agents are available 24/7/365. Within each bargaining unit, Shop Stewards are in place to stand up for fellow members when the need arises in the workplace. They are leaders, acting as the first point of contact to navigate issues between employers and union members. They are the voice of the union on the job and they are trusted and respected for their diligence in doing what’s right. We are committed to our Teamsters 987 community, which is made up not just of our members, but also their families and the people around them. Being part of Teamsters Union 987 affords members unique benefits that many non-unionized workers are not able to enjoy, and these benefits extend to the people around them. As the quality of life improves for our members, their spouses, children and neighbours can all reap the rewards. While the families of our members enjoy the peace of mind that their loved one is working in a safe and secure job, they can also look forward to the support of their union family even in retirement. And because we believe in building into future generations, children of our members are also eligible for academic scholarships like the James R. Hoffa Memorial Scholarship. Teamsters Local Union 987 Youth Committee is preparing and serving dinner for 250-300 in need individuals at the Edmonton Mustard Seed on Friday April 1, . Members of TLU 987 Youth Committee volunteered time for the Salvation Army’s Christmas Kettle program this past holiday season. TLU 987 has initiated a youth team sport sponsorship/donation for 2016. Members, please click here for more information. TLU 987 operates a charity raffle at 987’s annual shop steward seminar. Proceeds are donated to a selected charity that support causes that matter to our members. Stewards raise on average $2,000 and Local 987 matches this amount. TLU 987 Youth Committee donated raffle proceeds to Edmonton’s iHuman youth outreach . Members participated in the distribution of toys for Edmonton’s Santas Anonymous. Teamsters 987 supports a mentorship program through Youth Unlimited and Worth Auto to provide training and work experience for young people interested in the automotive sector. TLU 987 casino night to raise money for a selected charity. Through these initiatives, our Teamsters Union 987 members are not only contributing to a more equitable workplace for themselves and those around them, but they are also helping to create a more equitable society.